When I was a very little girl, I visited my great-uncle Norwood and great-aunt Eula on their farm in southwestern Virginia. Uncle Norwood still milked his small herd of cows by hand. When he did, the barn cats would gather and sit up with their mouths half-open, waiting for him to bend the placid cow’s teat and shoot some milk in their direction. They’d clean the rich milk off their muzzles and come back for more. When I saw this old postcard, I purchased it because it reminded me of milking time on Uncle Norwood’s farm. I dug around a little and discovered that in the 1910s, the idea of direct marketing from farms to new urban consumers was a topic of Department of Agriculture conversations, hence the title “From Producer to Consumer Direct” is satirical. “From Producer to Consumer Direct,” publisher unknown. Postally unused, 1910-1920? Then I saw this real photo postcard, which had been misidentified as a cat pulling on a string. I knew what it was, a close-up view of the same technique that Uncle Norwood used and that’s depicted in the other postcard. This is a snapshot of a well-established routine. 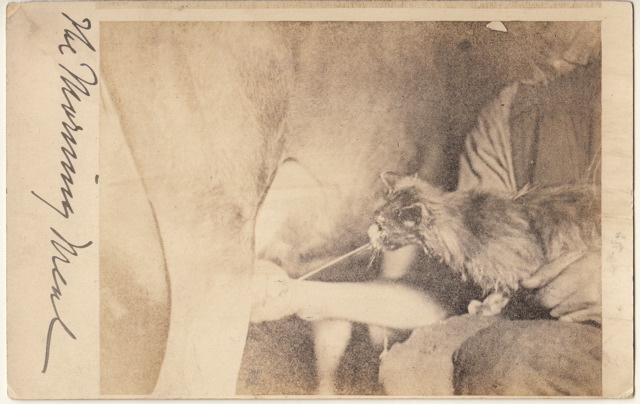 The cat is old and a little scraggly, but it is sitting on the milker’s lap. 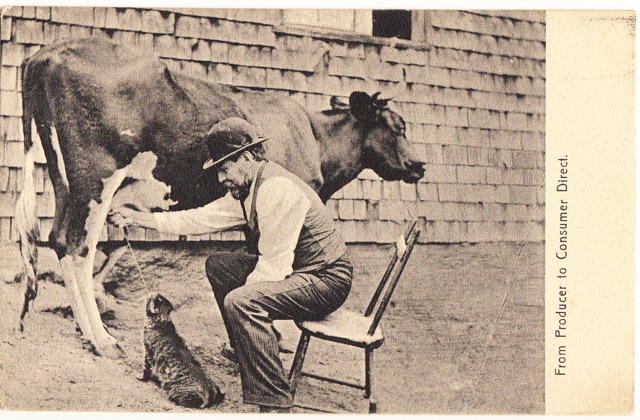 Barn cats and other cats who worked to keep rodents out of barns and stables were sometimes both pets and workers. They played important roles on the family farm, although their lives were often cut short by infectious disease and accidents. It’s nice to see a little evidence of appreciation, a special “Morning Meal,” for these unheralded workers. “The Morning Meal,” real photo postcard. Photographer unknown. Sent to Mr E. A. March, Cincinnati, Ohio, from East Saint Louis, 26 January 1915.